ISTIQ SPARK ARRESTOR @ SPARK ARRESTER remove sparks, soot and solid matter while preventing noise instead of muffling it. When exhaust gases enter the silencer, a special stationary impeller whirls the gases to throw out all solid matter, and at the same time, partially breaks up the exhaust slugs. Cleaning efficiency is high. Exhaust gases then enter the snubbing section in which the energy of the exhaust slug is further dissipated without interfering with the flow of low energy gases to the atmosphere. Model IXSA Provide Attenuation up to 30 dB. ISTIQ SPARK ARRESTOR are designed to efficiently reduce inlet and discharge noise of diesel engines, blowers, vacuum pumps, compressors and all situations requiring control of intake or outlet equipment noise. quality silicone based heat resistant aluminium paint which provides lasting protection at temperatures up to 600oC. Whenever ventilation is required in the enclosed compartment and at the same time noise is to be controlled, installing duct silencers or attenuator are the best way to solve the problem. The silencers permit air to flow through while reduce the noise by absorbing it. In selecting a silencer, a balance between noise attenuations and pressure drop need to be considered carefully. By using internally developed software, ISTIQ NOISE CONTROL can help to make the right choice quickly and most importantly, accurately. 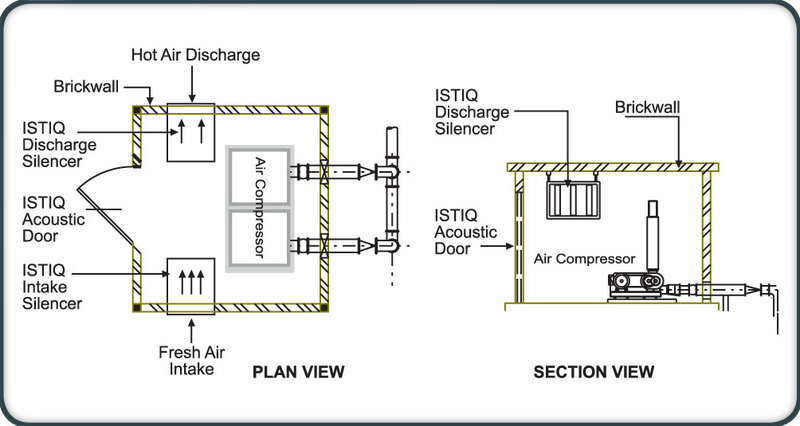 ISTIQ DUCT SILENCER are designed to efficiently reduce noise by generator sets, air handling systems, compressor, blower system and all situations requiring air intake and outlet for these equipments to operate. A duct silencer should always positioned in the plant room and if possible as close to the noise source as possible. Normally for a single equipment, two units of duct silencers - intake and discharge is required to effectively reduce the noise to a desired level. ISTIQ DUCT SILENCER are available in two different models, which basically have two different thicknesses of splitters - 200 mm and 300 mm. The thicker the splitter the better performance at lower frequencies. Each of the models have six length sizes from 900 to 3000 mm. The cross sectional area has no limited size. ISTIQ DUCT SILENCER will be supplied in sections whenever the silencer dimension exceeded 2100W x 2100H x 2100mmL. This will make the transportation and installation easier. The assembly of sectionalized silencers to be done at site. 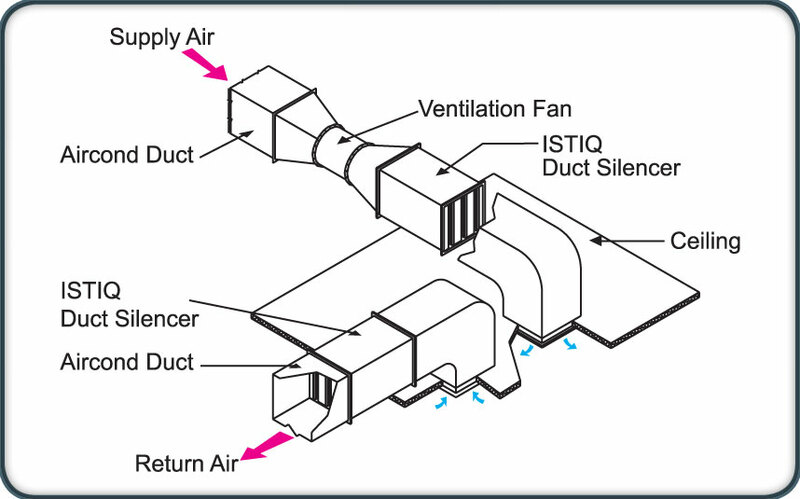 Some typical ISTIQ Duct Silencer applications and installations. ISTIQ EXHAUST SILENCER are designed to efficiently reduce inlet and discharge noise of diesel engines, blowers, vacuum pumps, compressors and all situations requiring control of intake or outlet equipment noise. All silencers are constructed from heavy gauge hot rolled cold quenched sheet steel with all welded construction. Internal components are stiffened and braced to minimise resonances and vibration induced fatigue. Flanges are supplied to Table C or American National Standard Institute (ANSI) requirement. Threaded pipe ends are to BSP or metric threads. Drain plugs are fitted as standard for removal of condensate. All external surfaces are finished with high quality silicone based heat resistant aluminium paint which provides lasting protection at temperatures up to 600oC. Whenever space is the limiting factor in designing Acoustic Treatment system, ISTIQ ACOUSTIC LOUVERS are the best bet to solving the problem. Serving a dual functions - reducing the noise and at the same time performs as weather louvers, ISTIQ LOUVERS is easy to install. Aesthetically pleasing, they consist of fabricated metal louver blades with acoustic infill, alternated with air gaps and fitted into a four sided metal case. ISTIQ ACOUSTIC LOUVERS come in two models - Model Lx and Model Ly. Each model offers of two different length, 300mm and 600mm. The maximum single unit available is 2400mm width and 2400mm in height. If a bigger size is required, it can be done through combination of modules. ISTIQ ACOUSTIC LOUVERS consist of fabricated metal blades with acoustic infill placed internally. The open area between each blade has been carefully designed to gain maximum acoustic performance and minimum airflow resistance. The casings are fabricated from galvanised iron or mild steel and have folded flanges both at the front and back. This design provides extra rigidity and the means for fixing the louvre blades in position. A bird guard, manufactured from 25mm square galvanized wire, can be supplied fitted to the rear face of all models, if required. ISTIQ VENT SILENCER reduce the noise produced by the expansion of gas or steam from elevated pressures to atmospheric pressure. These absorptive silencers are used to suppress noise generated by high velocity gas streams such as steam vents, safety relief valve outlets, system blow downs and purge outlets. Each vent silencer is designed to attenuate the noise level to the required sound pressure level criteria at a given distance from the silencer. Typical VENT SILENCER are welded heavy-duty units. The inlet nozzle and diffuser are constructed of steel and are welded. 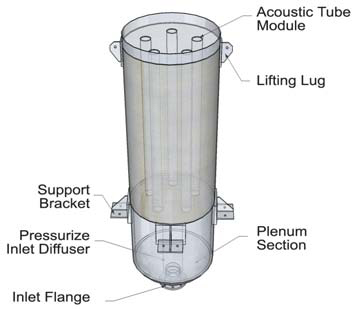 The diffuser provides controlled pressure expansion to atmosphere and uniform flow distribution through the acoustic section of the silencer. 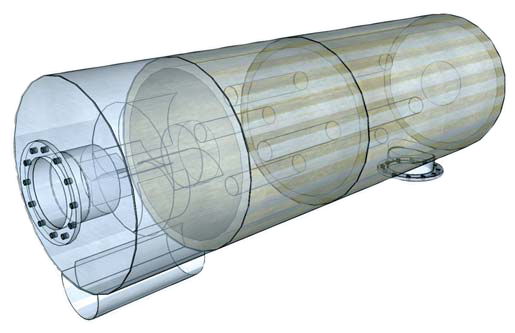 The lined inlet plenum (expansion chamber) of the silencer is designed with a double shell separated by a layer of acoustic insulation and sound-deadening material. The inner shell is solid to prevent shell radiated noise and migration of the acoustic fill. The transmission loss across the plenum and bottom head is comparable to the silencer attenuation.